Often referred to as “virtual reality,” solution providers are incorporating many forms of computer-generated sensory input into their platforms to capture the attention of digital natives. Virtual reality is a computer-generated, simulated environment. True virtual reality places the user inside the experience. Even if a company is willing to outfit its staff with costly virtual reality headsets, sensitive workplace scenarios, such as fraud, workplace safety and violence, sexual harassment, and even cyber risk, are not suitable for being experienced in a visceral way. 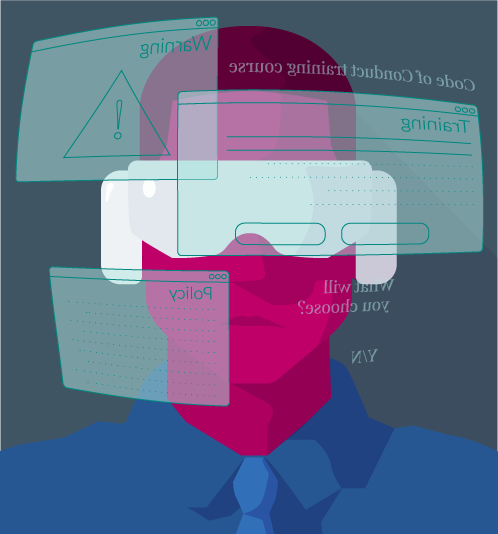 Therefore, true virtual reality is not a reality in enterprise e-learning today. Instead, people frequently say “virtual reality” when they actually mean “augmented reality,” which is being used more frequently within the context of learning. Augmented reality inserts computer-generated sensory input, usually sound, video graphics or GPS data, into the user’s environment. This input runs the gamut of technological sophistication. At one end are basic tools such as “just-in time” pop-up videos. For instance, learners may go on-line to book travel and a video will appear apprising them of what the company’s travel policies are. At the other end are interactive tools such as sensory recognition. For example, apps are available that identify what users are seeing through the camera lenses on their mobile phones. 1. The same information is being presented to all learners, many of whom may already know the material. 2. There is no way to ensure engagement with the content, since the user may “click and close” or simply choose to ignore it. Despite its novelty, augmented reality does not change the fact that the human brain is cognitively wired to learn through decision-making and doing. Computer-generated sensory input may initially grab attention, but it does not force learners to absorb or act on the information they receive. Thus, augmented reality is a good tool for reinforcing concepts or providing access to basic information, but it has yet to find its place in core learning curricula.reality inserts computer-generated sensory input, usually sound, video graphics or GPS data, into the user’s environment. This input runs the gamut of technological sophistication. At one end are basic tools such as “just-in-time” pop-up videos. For instance, learners may go on-line to book travel and a video will appear apprising them of what the company’s travel policies are. At the other end are interactive tools such as sensory recognition. For example, apps are available that identify what users are seeing through the camera lenses on their mobile phones.